WASHINGTON (CNN) - A key Democrat Monday called for the formation of a commission to launch a wide-ranging investigation of alleged wrongdoing by the Bush administration's Justice Department. 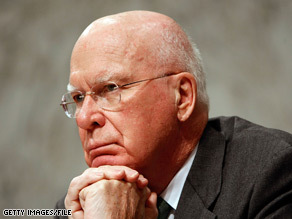 Senate Judiciary Committee Chairman Patrick Leahy, D-Vermont, called establishment of such a commission a "middle ground" between those who are demanding prosecutions, and those who simply want to put past disputes to rest. "I don't want to embarrass anybody. I don't want to punish anybody. I just want the truth to come out so this never happens again," Leahy told a student audience at the Georgetown University Law Center. A senior Republican dismissed Leahy's proposal as "politics as usual." Leahy said he wanted a "truth and reconciliation commission" to conduct a "comprehensive" investigation into what he called illegal warrantless wiretapping and torture as well as politically-motivated hirings and firings. He said he was open to whether such a commission would be congressionally appointed or would include Administration-appointed members similar to the 9/11 Commission. He did say any such commission should have power to subpoena witnesses and be able to grant immunity from prosecution except for perjury. Leahy's comments are likely to re-ignite a simmering debate about how actively to focus on past political and legal policy disputes. Attorney General Eric Holder and President Obama have indicated they are cool to focusing too heavily on past arguments, with the President warning against "criminalizing policy disputes". Holder has promised some unspecified internal reviews at the Justice Department. Holder's office had no immediate comment on Leahy's remarks. House Democrats led by Judiciary Committee Chairman John Conyers have urged an aggressive approach to holding Republican partisans accountable for Justice Department failures during eight years under three Attorneys General. Meanwhile, Congressional Republicans have strongly rejected any further investigations. The top House Judiciary Committee GOP member Monday blasted Leahy's proposal. "No good purpose is served by continuing to persecute those who served in the previous administration," said Rep. Lamar Smith, R-Texas. "President Obama promised to usher in an era of "change" and bipartisan harmony. Unfortunately, the continued effort by some Democrats to unjustly malign former Bush Administration officials is politics as usual," Smith said. Smith cited the four detailed reports stemming from Inspector General investigations, and said recommendations made have been implemented. He said Democrats also had already conducted a two year inquiry in public hearings. "Rather than continuing to waste taxpayers time and money on fruitless finger-pointing, Congress should focus on the future and what we can do to help the American people during these difficult times," Smith added. We are BROKE and hurting in this country, so do we really need to spend MILLIONS on this subject. Lets move forward and get past this last eight years. If they do this all it will be is game playing. Do [R]s bother to listen to the hypocritic drivel that pours out of their own mouths? I guess when you have lost your way so fully as to have become part of such a clinically deluded clique, there is no pride left in tyring to match your rhetoric with reality. their current leaders, and those of the past 8 years, certainly show no sign of having a grasp of reality. Whatever it takes and how ever long it takes, the truth must come out and I don't care if it's a Democratic or Republican wrong-doing. The PEOPLE of this country deserve to know what our elected officals are up to. If officials know they can be procecuted after serving, they will think two or three times before goose-stepping along with the power brokers and deal makers that think they are above the law. Good Luck with this. If the investigation is run like they did it in Alaska, everyone will get off with not even a slap on the wrist. Both Cheney and Bush deserve to spend the rest of their lives in Federal Lockup for violating so many laws (that I can't begin to count them all), but with their arrogant attitude (Cheney) they figure they've done nothing wrong. wonder if the republicans that hire prostitutes.. pay tax on that or claim that on their Taxes? Or is it that the American public is paying for it. Hey Leahy... don't just talk, WALK the walk. Bring these criminals to justice. Everyone else in this country is held accountable if they break the law. Don't waste our time blowing "hot air" if you're NOT going to do anything about it. GO HOME if you have no backbone backing up your feeble threats. Just go home. Vengeance is a dish most enjoyed when cold. I hope your future cell mate is "extra well-endowed" and finds you pretty! Why don't you grow up a little. Your comment about Democrats need to pay their taxes. Don't put them all in the same basket. Thats like saying "Republicans need to stop cruising airport bathrooms, and getting houses remodeled for kickbacks!" MORON! "I just want the truth to come out so this never happens again". Lets stop with the revenge killings and move forward and stop wasting our tax dollars at a time when we need all of them for the future. Stop showboating Leahy! The American public is sick and tired of this constant politics and revenge , back and forth, back and forth. It is not your turn and it needs to stop now. Someone turn up the music so we don't have to listen to anymore negative politics anymore. Fine, just as long as we can form one to investigate the corruption of Fannie Mae and Freddie Mac. Oh yeah, how much is this going to cost? Just like the republicans pursued Whitewater, go get 'em. Get 'em all. Get Bush, get Cheney, get Rove. Get them for reducing the justice department to a political tool, get them for outing Valerie Plame, get them for lying to the American people and killing our soldiers in Iraq. Get them for advocating torture, get them for illegally enriching Halliburton, get them for arrogantly peeing all over the constitution. Indict them for their stupendous incompetence that has made the world a more dangerous place for the citizens of the USA. Lets just put all the America should fail republicans in camps. Time to prosecute Gonzo and the rest of his gang for hiring Republicans-only in the DOJ. The one place that's SUPPOSED to be free of politics... and DUBYA had to violate and corrupt that too. Dubya is without a doubt the WORST President in our nation's history. "No good purpose is served by continuing to persecute those who served in the previous administration," said Rep. Lamar Smith, R-Texas. Ummm, continuing? Congress's attempts to get cooperation from the executive branch in the past 2 years have been a total joke; the time to persecute... or rather prosecute... those who broke the law in the Bush White House is NOW, now that these anti-American plutocrats no longer have their hands on the reins of state. Restoring the rule of law is as necessary as addressing our economic crisis, and congressional white-wash commissions are not the answer. Prosecutions from within the DoJ or by Special Prosecutor ARE the answer. sounds like the republicans are shaking in the boots. they don't want anyone to know what crooks bush and cheney are. Funny how all of a sudden, when it is a GOP President under investigation all we hear is "leave the past in the past"...yet all these same GOP wanted to go after Clinton for Paula Jones, and that didnt even happen when he WAS president...the stuff they are investigating Bush for happened when he WAS president. Big, huge, difference. "Leaving the past in the past" is a partisan tactic, designed to get their people off scot free. Yet, how many times have we seen Impeach Obama nonsense and people calling for him to resign, when he hasnt done ONE thing anywhere NEAR as bad as they want to investigate Bush for. If you *truly* want to leave the past in the past, then leave the partisan politicking in the past, and allow criminals to be investigated. Don't get too fired up. They already cut a deal with the new attorney general. The republicans didn't put up a fight even though he's for more gun control in exchange for not looking into past potentially criminal activity. Both parties are in bed together. Humm.... should we check this out with Joe the tax evading fake plumber? Let the comission begin. It is time to the past administration policies and shed light on them. Put a muzzle on your hate attack dogs ! Remember ; what goes around comes around! Politics are going to bring this country down !! Let the comission begin. It is time to review the past administration policies and shed light on them.